Once again the Atlanta Falcons are on the road, this time heading to meet their rivals the New Orleans Saints in the Mercedes Benz Superdome in what will be the 10th anniversary of the reopening of the historic stadium. Despite all the media buzz about this being the pivotal game for the Saints, where they turn their season around and rally the fans and make history like they did 10 years ago, the reality is quite different, the Saints defense is hurting and there are a lot of question marks that need answers. 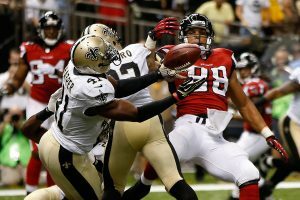 On paper the Falcons have a clear advantage over the Saints and if they know how to exploit it they will walk away with a sweet win. Last week the Atlanta offense gave a very convincing performance against the Oakland Raiders, if they can play the same way this week they will have this game in the bag. Center Alex Mack and offensive tackle Ryan Schraeder have been solid so far this season, OT Jake Matthews seems to have gotten his mojo back; guard Chris Chester is the one that hasn’t been up to par thus far. Veteran quarter back Matt Ryan is currently number two in passing yards in the league with 730. Rounding up the offensive line up we have star wide receiver Julio Jones, tight end Jacob Tamme, wide receivers Mohamed Sanu, Aldrick Robinson and Taylor Gabriel, and in the backfield Devonta Freeman and Tevin Coleman, all of whom are finding their key spots and contributing to making this offense as good as it can be. With such a consistent offense from the Falcons the question now is, how does the New Orleans defense stack up? The answer is a bit murky, while they do have some valuable players like defensive ends Cameron Jordan and Paul Kruger which could pose a problem for Ryan, they also have unknown or inconsistent player in their defensive lineup, like defensive tackles Nick Fairley and Tyeler Davidson. The truth is the New Orleans defense is in trouble after losing cornerback Delvin Breaux in the first game of the season, which means Ken Crawley and Sterline Moore have their work cut out for themselves. But they do have one of the best safeties in the league, Kenny Vaccaro, but unfortunately there is only so much he can do; another problem area in the Saints defense is their linebackers which have been inconsistent at best. Having said all of that, this defense only allowed the NY Giants 16 points in week two; so they will surely put up a fight here at home and especially on such a memorable day. The one defensive player that the Falcons offense need to control is Cameron Jordan who is likely to create all kinds of trouble and if he is not guarded correctly could get to Matt Ryan and disrupt his entire game. Bottom line, Falcons take the game and if Matt Ryan is able to get time in the pocket the Saints could get shutout just like the Texans did on Thursday night. Make sure to check out all the NFL props and alternative lines for this Monday Night Football game at Ace Sportsbook.